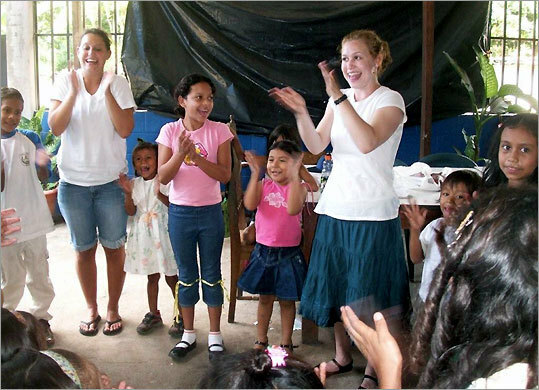 Allisa Whitman and her sister Rachel (left) teaching the children of San Jose Villanueva. WHO: Allisa Whitman, 19, of Northampton, her sister, Rachel, 23, of Brookline, and their mother, Terry Phillips, 54, of Hollis, N.H. WHEN: June (Allisa for three weeks and the others for one). WHY: To volunteer with Epilogos Charities helping the people of San José Villanueva. SENSE OF COMMUNITY: Mother and daughters had visited the village an hour south of the capital, San Salvador, before, but never together. The municipality has about 12,000 residents, many of whom live in mud or aluminum-sided homes. Through friends, the family learned of Epilogos, a New Hampshire nonprofit organization that works on community development issues. "We keep coming down because we meet people and keep connecting with them," Allisa Whitman said. "It's almost like home. This was first time I was there for an extended period of time." NOT JUST YOUR LIFE: "Although I'm used to going there, it's still an overwhelming experience. It takes you really sharply out of your own life," said Whitman, a sophomore at Smith College. "Although it takes you into a different world, you realize that people are all the same. Us three being there together was nice, and we could talk about everything we did and saw." SCHOOL BOOSTERS: They worked with schoolchildren through a literacy program, helping students with coursework and also teaching some basic hygiene skills. "One of the other things we like to do is go to the ninth-grade class and talk to them about high school. Compulsory education goes only until ninth grade." Epilogos provides scholarships for school, which costs about $150 a child. "That's a lot to them. So we explain about the scholarships. A lot of time families feel they can't afford to send kids to school not just for the costs, but losing them as workers. We try to show them how, if they get an education, they can do better later." HANDS-ON HELP: After her sister and mother left, Allisa spent the next two weeks at the health clinic. "I have an interest in medicine and I did a lot of things I couldn't do if I was in the States," she said. "I gave injections, I helped clean wounds, and I did a lot of observing." WORK AND WALLETS: "You can change some things with talk and work a little bit, but it's money that really changes things," Whitman said. "But I can take my experience in the clinic to help raise awareness."